Interfering Brussels’ bureaucrats could ride roughshod over Britain’s wishes and allow 60-ton foreign ‘mega lorries’ to roll onto UK roads. UKIP West Midlands MEP Mike Nattrass, who is a member of the Transport and Tourism Committee at the European Parliament, has condemned plans by the EU which would allow huge lorries from the continent to use Britain’s roads. Mr Nattrass has this week joined the UK freight industry in expressing dismay at EU moves to push the 25.5 metre behemoths onto our roads despite the British Government banning them last year. “Once again the EU is doing what it does best – interfere,” he said. “I am totally opposed to these giant vehicles being allowed on our roads. Britain has already said no to these vehicles in the past but the EU is ignoring our wishes again and is trying to plough on with their plans regardless. “The mega trucks would be fifty per cent longer than existing lorries and would be substantially heavier which would be more damaging to our road surfaces. "Can you imagine the private M6 toll road, over which the Government appears to have lost control, welcoming these? "We should get trucks off the roads and use rail containers. This EU ruling is a major incentive to send freight in the wrong direction, the correct direction being by rail. 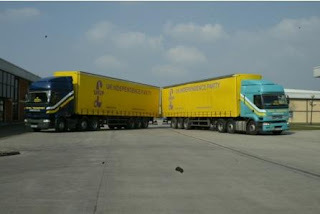 “The EU wants these so-called super lorries but Britain does not. Again we should all say a resounding NO to the EU, pull out of the European Union and make our own laws and policies in Westminster,” he added. In a press statement issued this week, Freight on Rail, (which is a partnership of freight operators Rail Freight Group, Network Rail, transport trade unions and Campaign for Better Transport), expressed their complete opposition to the mega lorries. Philippa Edmunds, Freight on Rail Manager, said: “Large quantities of long distance freight can be more sustainably and more safely carried by rail, than in even larger lorries. “The reality is that, even though the UK Government voted against trials of mega trucks in June 2008, if Europe gives the go-ahead for cross border mega trucks traffic between member states, they will come to the UK by default, over time. “The commissions’ own sponsored research showed that mega trucks are individually more dangerous than standard HGVs.” Freight on Rail added increases in lorry dimensions has resulted in more lorries driving around less full causing more road congestion and more pollution. As a road haulier, I am totally against this plan. When the switch from 38ton to 44ton came, we were expected to move larger loads for the same money. Our RFL, insurance and fuel bills all went up. Whilst I disagree with most of 'Freight on rails' conclusions, larger heavier vehicles are not the answer, any more than increasing subsidies to rail are. And yep they are my trucks! Let the British Government decide what is best for Britain. Our parliament should not be overruled by the unelected bureaucrats from Brussels.